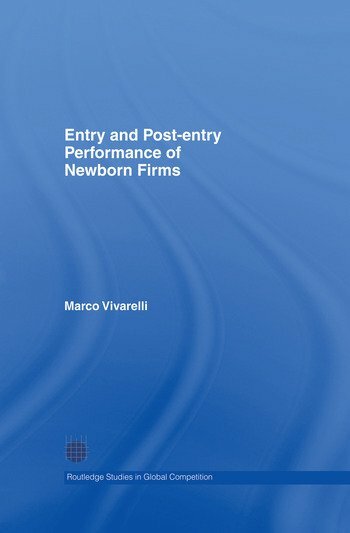 Entry and Post-Entry Performance of Newborn Firms focuses on newborn firms, analyzing the determinants of entry, survival and post-entry performance. Written by a world leading expert on industrial dynamics, whose previous book The Employment Impact of Innovation was very popular, this book examines the policy implications of the differing motivations underlying the decision to start a new firm. This groundbreaking book will be of use to economists with an interest in Europe as well as students and researchers across industrial economics, management and entrepreneurial studies. Marco Vivarelli, Ph.D. in Economics and Ph.D. in Science and Technology Policy, is full professor of Economic Policy at the Catholic University (Milano) and Research Fellow at IZA (Bonn), the Max Planck Institute of Economics (Jena) and CSGR (Warwick University).